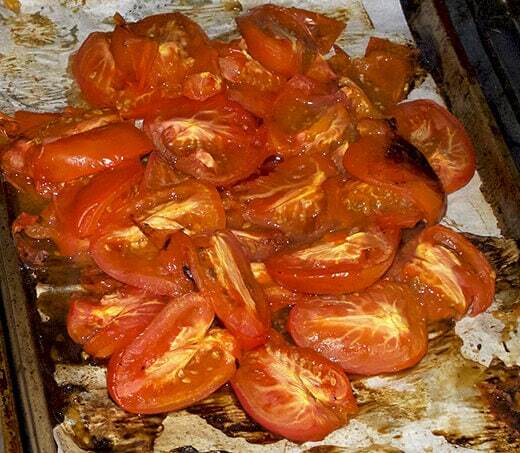 Roasting tomatoes in the oven cranks up the lycopene level and makes tomatoes a powerhouse of health. This is one of my beloved classics! With so much flavor coming out of roasted tomatoes, few other ingredients are needed to make this sauce delectable. This pasta recipe is very easy to follow, the only thing needed here is time since the tomatoes will need about 45 minutes in the oven to roast and ooze out the right amount of sweetness. A hand blender or regular blender is also needed. Cook your pasta, reserve about a cup of the salted pasta aside. 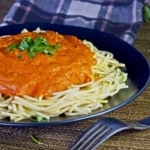 DO NOT RINSE, only drain it (rinsing pasta takes the starch out, therefore making the pasta unable to stick to or absorb any sauce afterward). In a medium size pot, add olive oil, garlic, red chili pepper flakes and onions. Cook on medium heat for about 5 minutes, then add the roasted tomatoes. Cook for 2-3 minutes (until onions are soft), turn off the heat and use a hand blender or blender to puree the mixture into a smooth sauce. Add your butter, the tomato sauce, stir, then add pasta water a little at a time until desired consistency. I use a little sugar to adjust the sweetness of the sauce (never more than a teaspoon) and some salt to balance it out. Sprinkle parsley over and serve.